I apologize if you've been coming here expecting a new post only to find that picture of my kids on their first day of school staring at you. It has been one busy week, I tell you. 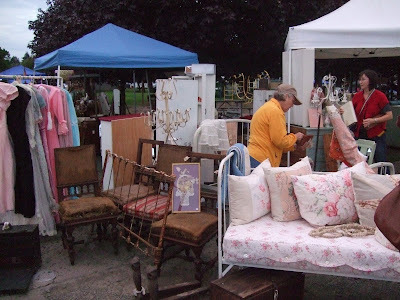 Last Sunday was the Coburg Antique Fair and despite a few problems with traffic and a little rain, we had a great sale. I spent a good part of last week working on some projects so I would have some new things for the show. Unfortunately I didn't take many pictures of the things I worked on, but I did get a picture of the newest shopping cart trio. I thought these turned out pretty cute. (I think I say that with all of my carts.) The one on the left is the only one I still have. The other two sold to two happy customers. The usual suspects were selling there like Joe and Sue. 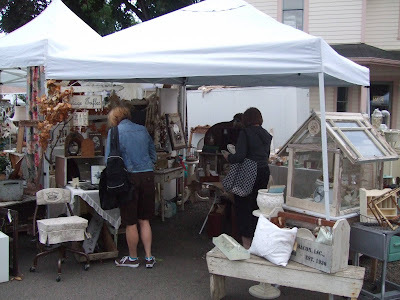 Cindy, Joy and Julie were also there selling, but unfortunately I didn't get any pictures of their booth. 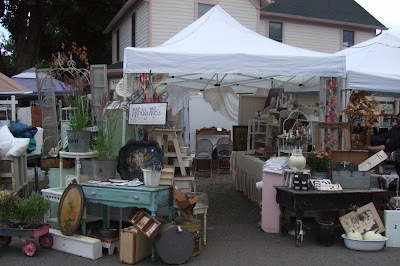 Here are a few pictures of our booths. 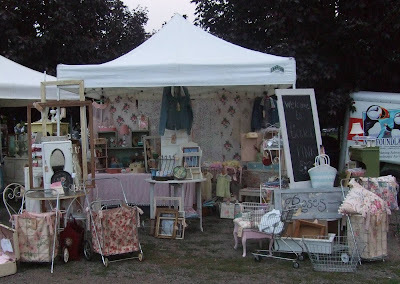 Isabel has some great pictures of our booths on her blog. You can check them out here. I did manage to do a little shopping while at Coburg. I'll have to show you what I found on my next post. Hope you are all having a great week! I wished I could have come, maybe next year, looks like you all had fun though. what a wonderful show!!! 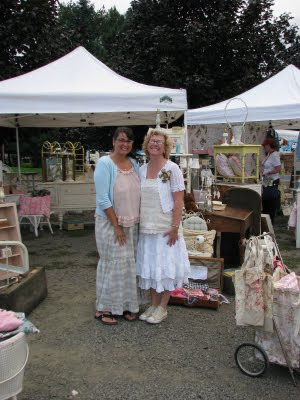 you and Isabel look so cute:) i just LOVE your shopping carts...i am planning to go to a big flea market/antique show soon, and i could really use one of those!!! I see a lot of things I would have enjoyed digging through! 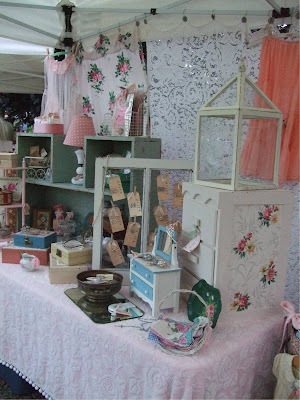 Great booth!! love all of the pretty creations that you and Isabel make. So pretty; wish I could have been there. You girls always look so pretty for your shows; I love the way you dress for them!! 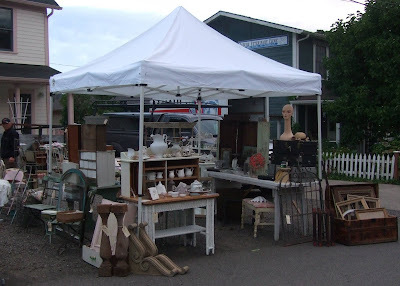 Love all those booths- especially yours!!! Why must you live so far from me? LOL!! I want to shop in your booths!! Love your blog, You have beautiful thing. Have a great day. You have a very Nice things and I love your blog. Looks like you had some fun stuff! And the space looks so inviting. It would have pulled me right in. I was there and wish I would have met you. I love to visit your blog. That show looked amazing.. 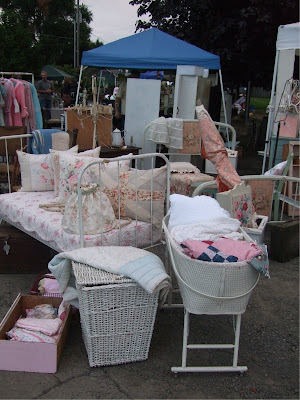 I really wish I could've been there.. How can so many pretty things be all at one show? Just gorgeous.. 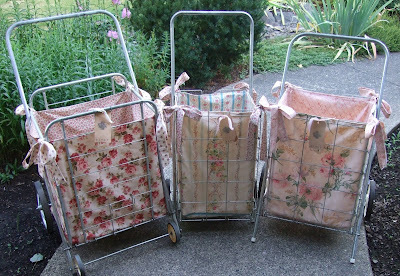 I love those sweet granny carts.. to Cute.. I fell in love with these picture of you booth. Your my kind of girl. Come visit my blog when you have a chance. I love people with talent!